Issues about war and peace, disarmament and non-proliferation can be daunting. Many people live in war-torn regions, and they understand first hand what it means to exist under conditions of conflict. Others live in communities free of armed violence, but there may be wars and conflicts fueled by their governments in other parts of the world. Some people may experience conflict at home. Others still may come from prosperous nations but live in poverty stricken neighborhoods where armed violence may be a part of daily life. Students can play a valuable role by taking action to create a safer world — from nuclear weapons abolition to curbing gun violence. Students can play a valuable role by taking action to create a safer world — from nuclear weapons abolition to curbing gun violence. Today disarmament is increasingly important because military spending and the proliferation of weapons have never been higher. Students can engage in countless activities to increase awareness about nuclear disarmament and also to take action based on their knowledge and analysis of the subject. A first step is always education. See our links to find out more from our partner organizations and from NGOs we know and trust. Once you’ve learned the basic facts, you can take action in a variety of ways! Hibakusha Stories Director Kathleen Sullivan has written a book with Professor Peter Lucas called Action for Disarmament: 10 Things You Can Do! Many of the ideas presented below are also described in the book which school libraries can order on-line. There are numerous ways that students can express themselves and make their voices heard on disarmament issues. Everyone has the right to express themselves, especially concerning critical issues such as the proliferation of weapons and the violence associated with them. Below are some suggestions for action with supporting links for more information. Remember that while you will want to pick a method that best fits your personal interest and creative style you will also want to take into consideration your target audience and their needs and circumstances in order to best get your message across. Express Yourself! Start A Club! Voice Your Concern! One way to initiate studying and discussing issues related to nuclear disarmament is to start a school club, as a during or after-school program. School clubs will spark the interest of participants and encourage them to read related material to better familiarize themselves with disarmament issues. It is important to create forums for discussion which allow for healthy exchange of ideas, and inspire participants to become actively engaged. One way to initiate constructive discussions, advocacy, and exchange of views on issues related to disarmament and non-proliferation is to start a school club, an after-school program, or even host/organize a youth conference. Such discussions would spark the interest of the participants and encourage them to read related material to better familiarize themselves with the topics. It is important to create forums for discussion which allow for healthy exchange of divergent ideas, and inspire participants to remain actively engaged. What follows are a few steps to get you started. You can start a club alone, but it’s usually better to recruit other students to help the process. Usually, a small group of students or youth leaders begins meeting informally to discuss ideas. It’s best to actively seek the support of key adults, such as a faculty member who can serve as an advisor or liaison. It’s usually best not to rush the process of starting a youth organization. In the initial process, students should discuss and brainstorm the following — the purpose of the club, short-term and long-term goals, and possible approaches to reach out to other students in the community in which you live. If possible, students should visit other school-based clubs or after-school projects to see how other groups got started, and how these established clubs are organized and run. This is a good chance to see what works and what doesn’t work. Usually after-school clubs need to have a description, a mission-statement, or even a short constitution. Similar documents from other clubs could be very useful to develop the same for your youth club. Usually, students have the right for holding meetings in their schools or on campus, as long as the group is student-led. You should consult with your school administration about any rules for organizing clubs. The key is to balance school rules with student rights through consultation and respectful dialogue. Most schools have funds set aside for student clubs and after-school activities. Check with your faculty advisor or school administrator to see what is available and what procedures must be followed to request such funds. Often times, groups have to submit a proposal to receive official club status. Once achieved, clubs can use funds for meeting and promotional activities. Even a one-time youth conference can sometimes request money from a school (or a school district/department of education) for extra-curricular activities. When everything is ready, hold your first meeting and welcome everyone. Your initial meeting should be more of a social occasion where people get to know each other and to informally discuss the ideas behind the club. Don’t be discouraged if your initial numbers are small or if they drop off after the first meeting. Most clubs begin small and grow. Continue to meet and promote you club and in time you’ll have a critical mass of students. As your club grows, you might begin to plan special events such as film screenings, presentations, lectures, and even a one-day or half-day youth conference. Activism for disarmament is often strengthened by public events. A well-timed event can disseminate information for awareness, crystallize different but related issues, mobilize people into social movements, raise money for projects, create new networks of interested groups, make visible the critical issues, promote upcoming events, as well as educate and train people to become agents for social change. Here are several ‘event’ examples that can inspire action for disarmament. School-based events are often organized around Teach-ins. These events are historically linked with the anti-Viet Nam war movement, where teachers and students protested the war by creating alternative classes to teach about the war and engage in peaceful protest. Teach-ins are usually planned in advance and everyone knows the time and place. Teach-ins often involve faculty or invited speakers to make a presentation or show some kind of media about critical issues, such as nuclear disarmament and the threat of war. One way to attract attention to disarmament issues is to set up a table in a public space and simply talk to people and disseminate relevant information. This activity is commonly referred to as tabling. The Animal Rights group PETA has a great guide for how to best engage in tabling. A demonstration or a rally is a public gathering of people to demonstrate or display a shared message in support of disarmament strategies. Demonstrations are sometimes spontaneous gatherings, but a rally is usually planned. Although demonstrations, and especially rallies, are held by people physically in a public space, demonstrations can also occur online in virtual public space. Activists use peaceful, non-violent demonstrations and rallies to announce their commitment to a cause, to raise awareness, to support a larger social movement, to protest perceived injustice, to make their voices heard, and make a public call for change. Non-violent and non-destructive acts of protest are ultimately the most persuasive. Methods of protest in demonstrations and rallies include public assemblies, announcements, keynote speeches, protest songs, handing out petitions, displaying activist art and making a concerted call for change. The messages in a demonstration can be directed towards the greater public, the media, political leaders, or people most affected by the issue. Check out Move-On.Org Civic Action’s Rally Organizing Guide, an excellent step-by-step guide to organize your event. A vigil is usually a quiet night-time event. Traditionally, vigils were meant for spiritual devotion and observance. Today, vigils are organized to offer support, show political solidarity, mourn a tragic event and display remembrance. Vigils often involve the lighting of candles to symbolically call attention to an event or a larger issue. Many disarmament events are held as vigils to remember the victims of armed violence and war. These events can be timed to correspond with certain symbolic dates, such as, the UN International Day of Peace observed every year on September 21st or annual vigils held on August 6th and 9th to remember the atomic bombings of Hiroshima and Nagasaki. There’s also the UN International Day for the Total Elimination of Nuclear Weapons. Here’s a video link to a candle light vigil held by our friends at ICAN in Australia to commemorate Human Rights Day and condemn the continued proliferation of nuclear weapons. A march or a procession in relation to activism simply signifies people walking in the same orderly direction for a reason. Political marches have a long and varied history such as the famous March from Selma to Montgomery during the Civil Rights Movement led by Dr. Martin Luther King, Jr. in the United States or the Salt March led by Gandhi in India. Activists have traditionally marched to call attention to the struggle for social justice, such as in the case of King and Gandhi. Marches are also used to highlight the need for nuclear disarmament, such as the largest anti-nuclear march in Central Park in June 1982, where 1 million people flooded the streets of Manhattan calling for the end of the nuclear arms race. Peaceful processions offer a poignant way to commemorate tragic events that have become social landmarks. Processions can be quite impressive with marchers carrying signs and banners. People often play music and sing as they walk. Sometimes protesters carry personal items such as family photos of those who have died in war or violent conflict. And people sometimes dress in symbolic ways to project a message. A formal procession can be a powerful means to spread a message across a larger landscape. People often join processions on route. This can be an effective means of recruiting new advocates for disarmament campaigns. Although marches sometimes move through hostile territory or areas rife with potential conflict, demonstrations that are non-violent are always the most effective. Showing a film about nuclear weapons, or related issues such as nuclear power, nuclear waste and radiation is a good way to attract people to the issues, spark debate, and move people to action. A film screening can be a single event or a series of films over a period of time. Today, there are many traveling film festivals, as well as festivals that are organized in school venues and through community organizations that appeal to youth. These festivals include feature films, documentary films and short video essays made by young people. Organizers can subscribe to an annual festival or program their own small film series in schools or local venues. See our links to films on nuclear issues to get you started on selecting films for your screening. Another good way to bring attention to disarmament and nuclear issues is to hold a concert, a poetry/spoken word reading, theater or dance performance. The combination of activism and the arts has been around for a long time and is often used to garner media attention and is another means of creating a concerned community. The Washington Peace Center provides an excellent step by step guide for organizing a concert or public arts event. Check out our Arts for Disarmament page to see a concert that Hibakusha Stories organized in May 2015 called With Love to Hiroshima and Nagasaki. A class that creates curriculum for disarmament education can hold a special ceremony to recognize their efforts. New knowledge can be displayed on school bulletin boards. Other classes can be invited to the final presentations. And culminating research projects can be presented to the wider student body and faculty in a school-wide assembly. Spreading the new learning around to the entire school can also allow for questions to emerge from other classmates. 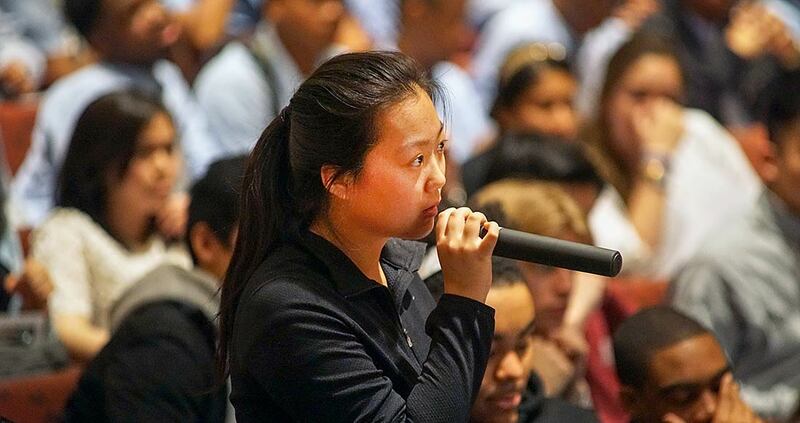 In short, participating students can share their findings, their ideas for social change and recruit new students to become activists for disarmament. Please refer to the “Other Hibakusha-Related Videos” on our Video page to see what students have done. Social movements are most successful when engaging in appropriate modes of action. Action can be defined by taking the knowledge you have about nuclear issues using this knowledge to advocate for change. One important way to take action is to join others so that a larger collective voice can speak together. As described above, people can mobilize with others physically in demonstrations, rallies, marches and teach-ins. But people can also mobilize virtually by using the Internet. Using the Internet to advertise and even to host an event is a growing trend in communication and in outreach. You can create an event on various social networking sites, blogs and twitter accounts. This gives people the opportunity to join your cause and spread information about nuclear disarmament worldwide. One of the advantages to creating a group or event on one of these sites is the huge number of people you have the potential to reach. People may find your group or cause by accident or you may gain membership through directed searches of the website. Either way you have the potential to reach a global on-line audience and make new friends from many different countries who are interested and active in the same issues that matter to you.